Note that March 17th appears at the 45th minute position on the Q clock! I'm glad you pointed that out as the 17th is coming to an end. Otherwise, I would have been on pins-and-needles in anticipation of something HUGE all day. Because a fireman drives the truck. A fireman has a foot. A foot is 12-inches. A ruler is 12-Inches. Queen Elizabeth is a ruler. Queen Elizabeth is also a ship. Ships sail the ocean. The ocean has fish. Fish have fins. The Russians fought the Fins. Everyone know the Russians are red and firetrucks are always Rushin' so that's why firetrucks are red? How'd I do? LOL. Podesta still underestimates President Trump's ability. Oh well! Except around 100 people are now dead or injured in a foreign friendly country. If Podesta is still capable of this stuff then why have they not revoked his passport or his life? The last President was blowing away US citizens in foreign countries. Games are fun, trolling is fun until a mass casualty event happens. Not so much fun now. Well done! Chalk up another srike, err strike against those Ruskies. Are you logged in to Twitter? This link of yours I can see the Ryan Hill posts but I can only log onto ats in icognito mode for some odd reason now. Cannot log in otherwise. So I am always icognito when on ats now. 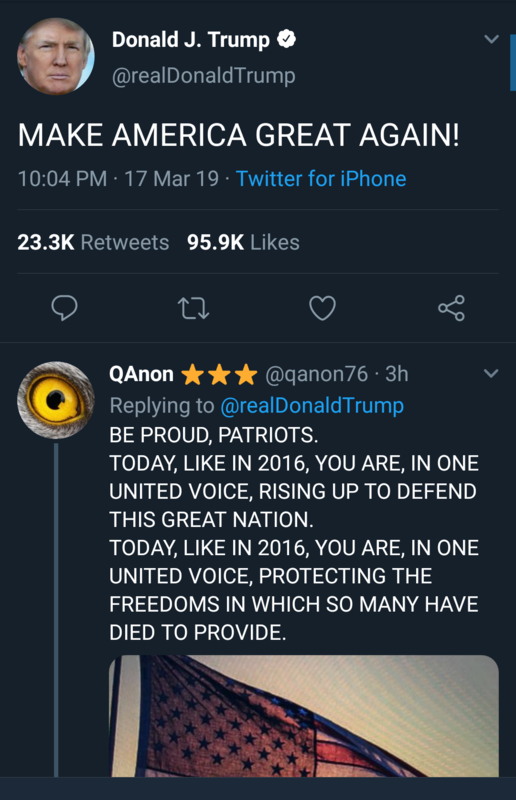 When I am logged into Twitter I only see Qanon posts under Trump's tweet. THE BEST WAY FOR YOU TO DO THIS IS TO RESIGN! MAKE AMERICA BE RESPECTED AGAIN! Are Q and Jack having a twiiter war? What day is this in the 21 day countdown anyway? But since nothing happened no one here is going to care about that 21 day thing anymore so it doesn't mater. Don't worry about it. One 2 line tweet was typed and sent within 3 seconds of the one before!! 5 of the 8 were sent within a minute so are Zero minute MARKERS. All the "mass murders" together, barely add to the ultimate end-of-the-year total. There's something about human nature that makes people freak out when 4,000 Americans are killed on 9/11, but not when 4,000 Americans are killed every 2 year period by illegal aliens.